A Raja went on to say that some forces were working against the UPA and for that they used Vinod Rai as a tool. 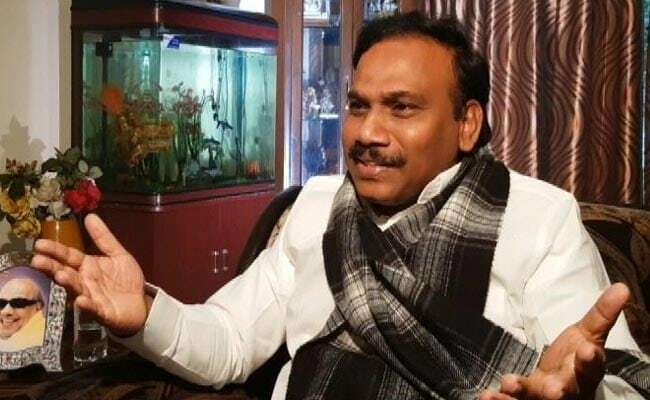 New Delhi: Former telecom minister A Raja today alleged that former CAG Vinod Rai was a "contract killer" hired to kill the UPA (United Progressive Alliance) government and called for his prosecution for "abusing" the power and "cheating" the nation. Mr Raja went on to say that some forces were working against the UPA and for that they used Mr Rai as a tool. "Vinod Rai should be prosecuted for cheating and abuse of power... (he) was a contract killer... His shoulder was used to kill UPA 2," Raja said during a media interaction following the launch of his book "2G Saga Unfolds". The then Comptroller and Auditor General (CAG) Rai came out with a report in 2010 which pegged notional loss of Rs 1.76 lakh crore to the national exchequer due to 2G spectrum allocation in 2008 when Mr Raja was the telecom minister. "Some forces wanted to kill UPA 2 for which Vinod Rai was used as the gun," Mr Raja said. Mr Raja accused Bharti Airtel chairman Sunil Bharti Mittal of conspiring against him to stop new telecom players from entering the market so as to maintain a cartel of a handful of service providers. He, however, praised former Prime Minister Manmohan Singh. "Because of protection and patronage given by him I was able to break cartel when tariff came down and teledensity went up. He (the former PM) wanted spectrum to be made available for public use," Mr Raja said. The mobile tariff during Mr Raja's tenure came down to 25 paise per minute from the range of Rs 2-4 a minute. Mr Raja said that he met Dr Singh for half an hour and gave him a copy of book. The former telecom minister, who was recently cleared by the CBI court of all the charges, said, "He (Dr Singh) deeply regretted whatever happened to me. He nearly broke down. I will disclose what went between us at an appropriate time." Mr Raja said there were differences among the cabinet ministers on the spectrum allocation issue. He said that Mr Mittal approached courts against spectrum allocation but failed and also went to the then PM and law minister but again failed to get anything. Mr Mittal "wanted to stall proceedings of my government," Mr Raja said adding that contradictions came from within the UPA ministers and there were instances to prove it. The former telecom minister said objections were raised by the finance ministry and the then Union Cabinet minister Kamal Nath wrote an open letter to Dr Singh that the matter should be sent to the group of ministers. Stating that the BJP benefited from the 2G controversy, Mr Raja, however, ruled out any possibility of alignment with the BJP. "We are for secularism. We will go with secular forces. Any change will be decided by the leadership," Mr Raja said. The book "2G Saga unfolds" was released by former Jammu and Kashmir Chief Minister Farooq Abdullah. "The principal of natural justice was not adhered by institutions. Ultimately injustice was done to me not only by individuals but the institutions like CVC (Central Vigilance Commission), CBI (Central Bureau of Investigation), CAG, parliament and sorry to say with due to respect to judiciary, even the Supreme Court," Mr Raja said. Also, he accused media of biased reporting by repeatedly citing documents and instances that accused him. But, the same media, Mr Raja said, did not show his reply to the CBI during court proceedings which went on for 14 days.